Deciding where to stay on a trip is rather a painstaking task as we don’t want to experience the horrors of sleeping in tacky floral linens camouflaging every imaginable living organism that has set up residence. We’re definitely no high rollers and although we like to stay within budget, we can’t call ourselves full-fledged backpackers either.Yet. having been confronted with reality (read: budget deficit).Sleep doesn’t come easy to me (Me being Kim) and I’m what you call a really light sleeper. A sound of a creaking bed, a closing of a door, whispered conversations would definitely wake me up and sleep is a precious commodity. We usually book standard air-conditioned rooms with a private bath. The luxuries of a TV and even a hot and cold shower we could afford to forego, but clean white linens factors a lot in our decision making process. This is a shared sentiment – printed sheets scare us a bit. We’re admittedly sissies like that. 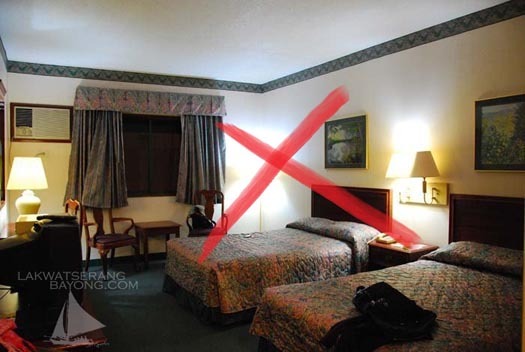 We also prefer non-smoking rooms since we both don’t smoke (anymore) and the stench of cigarettes isn’t exactly my idea of a soothing aromatherapy. Location of course is very important as proximity to other establishments, attractions and commuting options can help save on transportation expenses; security can also be determined by the type of neighborhood. And to round it all off is the price. Admittedly, if our style is not cramped by money, deciding where to stay would be a no brainer. But for our upcoming trip, we have grudgingly agreed on a ceiling accommodation allowance and we’ll try our best to stick with it as we can’t afford to foray far north of that magic number. With regards to our guiding standards, hundreds of listings of hotels, hostels and guesthouses are meticulously reviewed for days. We’d cross reference the facts on different websites, and read all reviews including those that are phrased in such a way that the reviewers point becomes guesswork because when you’re on a tight budget, every adjective matter. 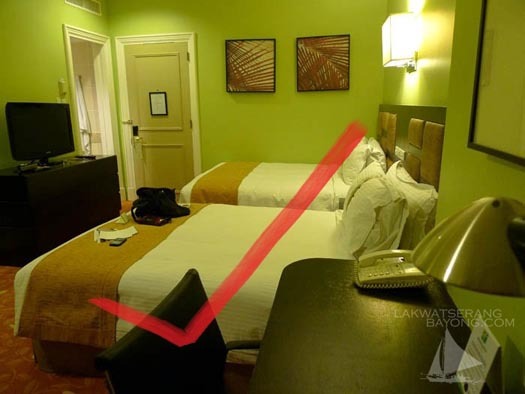 Booking sites that offers discounts and personal experiences of guests shared on their website has served as well on our previous lakwatsas. Based on our experience, agoda.com has always followed through. We get a no hassle cheaper rate, sometimes even up to 60% discounts. While we’re only looking for basic resting necessities, in some countries and even in the Philippines, finding a room that meets all our condition is still not easy. Of course it always boils down to the price. Basic as they are, private rooms with ensuite bathrooms don’t come cheap. be thrown out the window.